Dutch baby pancakes (sometimes called German pancakes or Dutch puffs) are a puffy and slightly sweet alternative to classic flapjacks. And they're so easy to make—just stick the batter in the oven, sprinkle some lemon zest on top, and dust lightly with confectioners’ sugar. Place a heavy 10-inch skillet in the oven and preheat to 425 degrees. In a large bowl, mix together eggs, flour, milk, sugar, and nutmeg until smooth. Let batter rest for 15 minutes. When ready to bake, place butter in the hot skillet and swirl to coat all sides. Pour in the batter as soon as the butter has melted and close oven door. Bake for 20 minutes, then turn heat down to 300 degrees and bake 5 minutes longer. 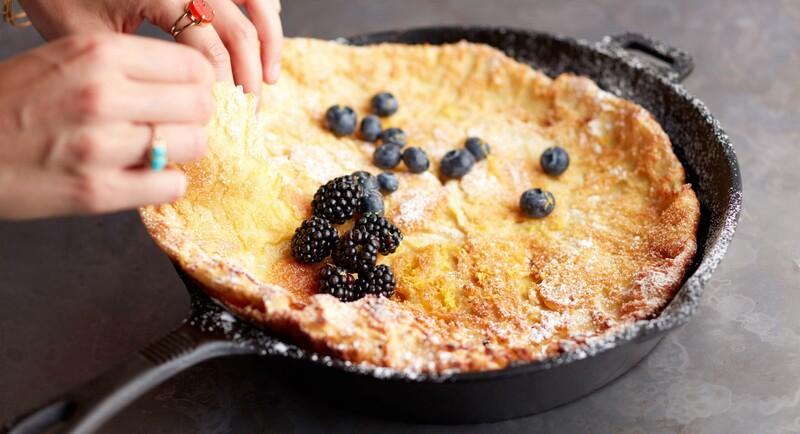 Remove pancake from oven, dust with confectioner’s sugar, sprinkled with lemon zest, and top with berries, to serve.